I didn’t see any mainstream media coverage of the WWF report, but then again, the Lance Armstrong soapie broke at about the same time and didn’t leave much room for other news. So coverage was left to the renewable energy bloggies. Here’s a sample of the headlines: “… Solar power could serve all the World’s Energy Needs”, and “… solar panels in harmony with nature”, and “…land requirements insignificant”, and “solar could power entire world with less than 1% of land mass”. “Bloggie” is a neologism related fairly clearly to “groupie” and I’m expecting it to go viral. Highlighting the fact that a global switch to renewable energy is not just necessary, but doable, a new report released by the WWF concludes that the solar arrays necessary to meet all the world’s projected energy needs in 2050 would cover under one percent of global land area. Obviously this is a theoretical exercise, and 100 percent of the planet’s electricity needs are not actually going to be filled through solar. What’s the problem? Well the problems begin with the letter ‘e’. Globally, electricity is only about 18 percent of energy use (IEA). So meeting all the world’s energy needs is very different from meeting all the world’s electricity needs. Both needs begin with ‘e’ but getting them confused is no minor matter. Think about that 2010 IEA (International Energy Agency) pie chart shown above. Most of the sectors are fossil fuels which need replacing with clean sources. Most oil is used in transportation and much of it can and must be replaced by electric vehicles. Other oil and gas is used for heating and again we will either replace these with clean electricity or by some kind of co-generation. Either way, the electricity slab of the pie must grow. You can compare the 2010 pie with that of 1973. The 2010 pie is bigger and electricity’s share has almost doubled. Nevertheless, three billion people still cook with wood or cattle dung. This might be carbon neutral and renewable but the smoke is doubly nasty. Apart from warming the planet, it prematurely kills 3.5 million people a year, including half a million children. A world without wood cooking stoves needs more electricity, much more. Yes, there might be some other clean technologies that will expand to replace parts of the pie slices but there is still a requirement for the entire pie to grow and for electricity to grow fastest of all and absorb as much of the other sectors as possible. Does anybody think you can shrink the entire pie or the electrical sector while simultaneously increasing electricity to the 3 billion people who still cook with biomass? Certainly, some countries, and Australia is an example, are electricity gluttons and they could usefully redirect some of their electricity use toward transportation, but justice demands that pie must grow to provide for the 3 billion “have nots”. In short, to have a shot at stopping the planet heating much more than it already has, we need to be tackling the whole energy sector, electricity alone isn’t enough. And tackling household electricity is only a part of tackling electricity. How big a part? That varies from country to country, but in Australia, household electricity is only about a quarter of all electricity, so the answer is “bugger all”. Adding a 3 kilowatt solar PV system to all of Australia’s 7.6 million households (assuming they all have adequate roof or yard space to install them), would deal with about 3 percent of our energy related greenhouse-gas emissions. The surge in rooftop solar is both a heartening demonstration that people want to do something about climate change, but also a disheartening demonstration that they don’t have a clue about the scale of the problem and the real changes that will make a difference. But wait there’s more. There are also some really significant non-energy climate killers. Scientists call them forcings. 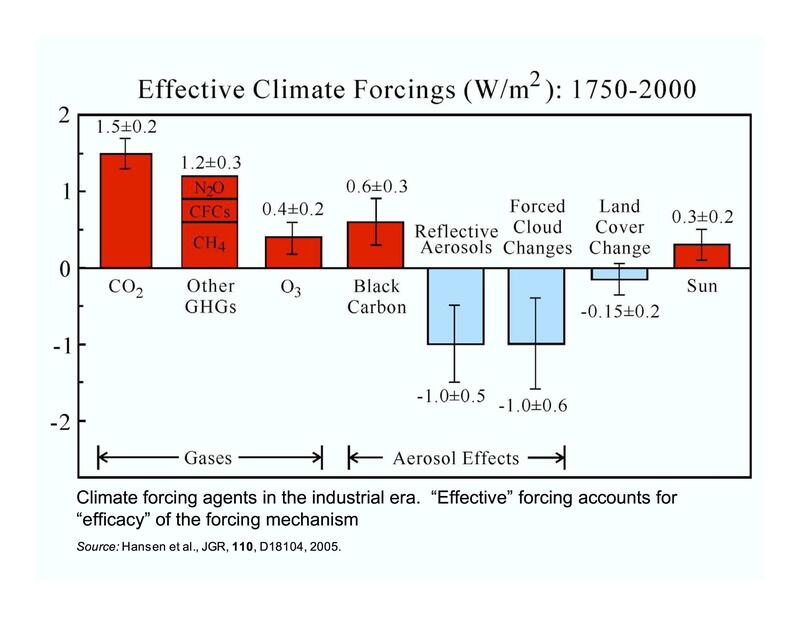 A climate “forcing” is anything which forces a change in the ratio of heat arriving to heat leaving the planet. If there is more arriving than leaving, then we have a problem. Globally, there are plenty of non-energy forcings which are really important. The climate forcing from Australia’s livestock methane isn’t just bigger than all household electricity, but bigger than the forcing from the carbon dioxide from all our coal fired power stations. Similarly, the carbon dioxide emissions from clearing peat forests in Indonesia has nothing to do with energy but it rivals Australia’s entire greenhouse gas emission inventory. So the bloggie mistake of mixing up energy and electricity is a big deal because an effective response to climate change must deal with both … and more. But let’s get down to the actual WWF report which is only about electricity, despite all the bloggie confusion over ‘e’ words. The report’s take home message is simple. Knowing we can supply electricity to the entire planet with solar panels on just one percent of the surface makes solar photovoltaic in particular and renewables in general look like an obvious and complete solution to our climate woes. Because one percent is such a small number. Isn’t it? What does one percent look like? One percent of Australia is a bit under 8 million hectares. Cover it in solar farms similar to the proposed Moree Solar Farm and you’d have about 12 times our current electricity supply and about 2.6 times our current total energy usage. In theory, we would have as much clean electricity available for export as we currently are exporting coal. We’d just need to run an extension cord up to Darwin and across a little bit of water to Indonesia with some double adapters and a bunch of power boards. Yes, I’m aware that the Germans have been having a few problems with the extension chords running out to their offshore wind farms, but they’re only three years behind schedule. How hard can it be? We had better assume that electricity export is feasible and persist with considering the 8 million hectare figure because we shall soon see that Indonesia won’t have a hope in hell of covering its WWF allocated area with panels. What does 8 million hectares look like? Consider all the cities and urban areas in Australia. They add up to just 1.6 million hectares, about 10 times more than we use for mining and waste management. So we can get an idea of one percent by multiplying all our urban and city areas by about 5. So drive from the centre of the city of your choice to its outer suburban edge, then start bull dozing trees and levelling ground for your solar panels until you’ve levelled an area about 5 times bigger than the city you just left. Do it for every city and you’ll have one percent. But what if you are fond of trees, bats and koalas? Let’s think about alternatives. We currently crop 25 million hectares, and these areas are already cleared and mostly level enough. So let’s just buy a third of our crop land and cover it in panels. That’s not sounding much better than the first alternative. No matter. Just keep driving. And driving. And driving. Out past the fringes of the cities and suburbs and on through the market gardens and interminable grape vines; past all the wheat and barley and sorghum fields. Out to the middle of nowhere. Being sure, of course, to avoid the 100 million hectares of protected areas including those for indigenous uses. Don’t forget to fill up with petrol before you pass the last town. Now, stop, think and compare. The proposed Moree Solar Farm is intended to cover 1129 hectares of land. Where? Near Moree. Is it good-for-nothing middle-of-nowhere land? No, it’s farm land. Remember, I rejected this, but they didn’t. They wanted to be near Moree. Near an electricity inter-connector, near workers, near supermarkets, near schools for the worker’s children, near every other bloody thing you need to build anything big. So one percent is 8 million hectares and covering it in panels is like building 7,000 Moree Solar Farms. The Environmental Impact Statement for the Moree Solar Farm detailed about 7,200 B-Double truck loads of material being shipped from Sydney and Newcastle over a four year period to build this relatively small 150 MW power plant. So 7,000 similar solar farms would require some 50 million truckloads of stuff being shipped out past all the trees and farms and workers and petrol stations into the middle of nowhere. I wonder if WWF has heard of the Ranger Uranium mine? The local aboriginal people have spent the last 40 years fighting mining companies who dug a bloody big hole for that mine. This bloody big hole is about 400 hectares. So it’s about a third the area of the Moree Solar Farm. Which makes 8 million hectares equal to some 20,000 Ranger mines … but with panels instead of a big hole. An agreement with the aboriginal people has now been reached at Ranger. The hole is being filled in and the next mine will be underground. The mining industry was a slow learner, it took decades to learn to consult with and treat aboriginals as a trusted work force worthy of investment and fair dealing rather than as a nuisance. What will Big Solar do when it wants to cover an area the size of 20,000 Rangers with panels and stuff? Will it consult? Will it pay? If we had the reactors, the uranium from just one Ranger could supply all our current electricity. According to the SBS documentary “Dirty Business” (part 3), the Ranger agreement is worth some $700 million. Would anybody like to estimate how many of the 20,000 Ranger sized areas to be covered in panels will require negotiation with traditional owners? Do I hear an insignificant number like “one percent”? Someone needs to tell WWF that terra nullius got put out with the garbage in Australia some time back. And of course there’s wildlife. How many sites will encounter wildlife issues involving protected plant or animal species? Do I hear a guess of just one percent? In which case we could generate about 200 legal battles involving perhaps three or four solicitors and a scientist or two for a couple of years each. The Desert Sunlight Solar project, featured by WWF in the Solar Atlas and mentioned again below, has a 2200 page Environmental Impact Study which is clear: habitat for various animals, including various species of “special concern” and the threatened desert tortoise, will be destroyed, including parts of what had formerly been called “critical habitat” for the tortoise. The most the tortoises got was an exclusion fence to keep them being killed during construction. How much is 50 million loads of stuff? But regardless of whether we deal sensitively with these issues or just bring in the red-necks and bulldoze compliance, the material problems remain. Is 50 million B-double truckloads a lot? Line up 50 million B-Doubles end to end and it would go around the planet 32 times. But let’s suppose we manage to find 8 million hectares of good for nothing land. Hopefully, wildlife free and a mere 300 km from our material sources of steel, cement and glass. That’s a 600 km round trip. Note that Sydney-Moree is a 1200 kilometre round trip, and Sydney-Bourke is a 1500 kilometre trip, and Perth-Kalgoolie is 1200 km return, so I’m being ridiculously optimistic. As it happens, our Bureau of Statistics keeps data on articulated truck distances traveled in Australia. Keep in mind that we are rather well blessed with bloody big trucks compared to many countries. Our 81,000 articulated trucks travel around 7,000 million kilometres annually, with rigid trucks doing slightly more. Not all of these articulated vehicles are B-Doubles, so we may actually need more than 50 million loads depending on fleet composition. In any event, the project would keep our entire current articulated truck fleet busy for over four years. If we devoted 10 percent of the fleet, then it would stretch out for 40 years. Now you are starting to see why an energy source’s footprint matters and why land close to your source of steel, glass and cement is at a premium. Nobody wants to drive out to whoop whoop, or build there, or work there. Practical feasibility cannot be determined by comparing the size of blobs on a piece of paper, but this is the entire substance of the WWF Solar Atlas argument. The oft-heard statement that Australia has plenty of sunshine and space shows a naive childishness that is inappropriate in dealing with a serious problem. And what about our northern neighbor? But what of other countries? The WWF Solar Atlas has some case studies. They didn’t study Australia, but did consider our northern neighbor Indonesia. In this case, the amount of land they considered necessary was about 1/4 of a percent of Indonesia or just half a million hectares (4897 square kilometres in the pseudo scientific precision of the WWF report). Now, Indonesia has an area of about 200 million hectares which is roughly the same size as Queensland, but with a population of 237 million people. How much free space is available? If the people were evenly distributed, the density would be 123 people per square kilometre and you’d need to displace some 600,000 people for the proposed solar panels. But, of course, the population isn’t evenly spread out. There are many protected areas in Indonesia and they include about 88 million hectares of the planet’s most valuable tropical forests. Subtract this forest area and, on average, there are 211 people per square kilometre and you’d need to displace over a million of them for the panels. How well do solar panels and rainforest mix? But using an “on average” figure like this is a little misleading, we can get a better idea of actual land availability by considering what other industries which need land are doing. What, for example, is the palm oil industry doing to get its land? It’s burning the forests and killing orangutans. Would it bother doing this if there were plenty of terra nullius just waiting for palms and panels? Does the WWF consider such matters? No. But aside from just not thinking and making claims without evidence, even the basic technical factors used in the report calculations are questionable. The back of the report contains a very nice picture of some very shiny solar panels at a First Solar project in the US, the Desert Sunlight Project (DSP) (mentioned above). This is a 550 MW $1.5 billion project spread over 1600 hectares. At an estimated 20 percent capacity factor, this will produce about 0.6 gigawatt hours of electricity per year per hectare [(0.55*24*365*0.20)/1600=0.6] with a very dense design involving 8.8 million panels and over 14,000 truckloads of stuff. The Moree Solar farm is much less densely occupied using quite different technology with just 640,000 quite different panels. Hence the anticipated gigawatt hours per hectare of the Moree Solar Farm is about half that of the DSP [(0.150*24*365*0.31)/1129=0.34] despite it using a sun tracking system to boost the capacity factor. In very rough terms, the DSP’s thin film technology gets double the energy density per hectare by putting almost twice as many truckloads of stuff in each hectare. The MSF and DSP represent interesting points on the solar design spectrum. But what’s the figure the WWF uses in its report as a reasonable figure for gigawatt hours of electricity per year per hectare? On page 52 it uses 2.6 gigawatt hours per hectare per year. If they used the First Solar actual project figure, they’d need to multiply the land required by about four and that’s an even bigger deal. Suddenly you need to displace some 4 million people or slash and burn far more tropical forest. And don’t forget. This is all just for daytime electricity. At night we’d be at the mercy of the wind or burning fossil fuels. But the questionable assumptions just keep coming. The report assumed that Indonesians, and everybody else on the planet, will consume 3,850 kilowatt hours of electricity per year per person in 2050. How reasonable is this? Australia’s current electricity supply generates about 11,000 kilowatt hours per capita. The OECD average is about 8,000 kwh/yr. WWF expects the Indonesians and everybody else to get by with half the current OECD average while also using that electricity to replace oil and gas. Has the WWF talked to anybody in China? In contrast to this WWF ‘proof by picture book’ approach to a serious problem, the Chinese are gearing up to mass produce small modular nuclear reactors (SMR). Each of which will generate about 10 times more electricity than the Moree Solar Farm despite being just a few metres in diameter. SMRs are being developed by other countries also and are generally designed to be shipped on railway carriages and buried. They can be put precisely where required. You really don’t need to drive to the middle of nowhere and fence off the tortoises. You really don’t need long extension chords and smart grids and energy storage. Just dig a hole, drop in your reactor, and connect a generator, desal plant, hydrogen generation plant, whatever. In the interim, the Chinese are building a back bone of huge reactors that will be generating somewhere between 450 and 670 (depending on how you read the proposed reactors list) TWh/yr (terawatt hours per year) of nuclear electricity by 2020. Nobody should be predicting further than that because the SMRs will be game changers, whether they come from China, Russia, South Korea or the US. Some are fast spectrum units that can use troublesome nuclear waste as fuel. Bingo, the so-called nuclear waste problem is gone. But aren’t the Chinese building solar panels? Of course. But not for serious electricity. It’s the jobs. With 1.4 billion people, jobs are a priority and, unless you’re a desert tortoise, solar jobs are as good as any other. So the Chinese are planning some 30 TWh/yr from solar PV by 2020. This is just under one percent of the China’s 2009 electricity supply and about one tenth of one percent of her 25,586 TWh/yr total primary energy. If you covered one percent of China with Moree Solar Farm efficiency, you’d cover about 9 million hectares and generate about 11% of China’s primary energy and 81% of the of the 3750 TWh/yr in China’s 2009 electricity supply. Note that China’s per capita energy and electricity use are both still well under half the OECD average, so to supply them the OECD levels of electricity, you’d need to cover about 22 million hectares in Moree Solar Farms. It’s clear that the main things making a dent in China’s fossil fuel usage in the future will be nuclear and hydro. Wind power in China will be interesting. It’s already producing 73 TWh/yr, but will it survive the factory roll outs of small modular reactors? Not likely. Why install something which is unreliable and buggers up your power grid when you have something which is cheap and reliable and doesn’t need a special grid or storage? The WWF should do better. It has a high powered scientific advisory board. Did they even consider this report? Or did they just give it the nod like the bloggies based on the pretty pictures and nice slogans? That’s not enough, this isn’t a game. The nuclear build of the 1970s shows us that we have everything we need to rapidly build a low carbon energy system. SMRs will certainly make it easier and quicker, but even without them we have the technology and we have the funds. We don’t need to hassle the tortoises, slaughter the orangutans and increase Aussie road kill with 50 million extra trips. We also know exactly how to roll back most of the last 200 years of deforestation but that won’t be helped by adding another source of habitat destruction. A world which is four or more degrees hotter should be terrifying enough to make us act promptly and with methods we know work on land we’ve already expropriated, rather than have us bugger up more of the planet with shiny but horrendously inefficient new toys. Shame on WWF for even suggesting it.